Our exclusive selection of oven mitts and gloves provides heat protection when handling hot pans and trays. Designed to withstand high temperature, oven mitts and gloves protect the hands of cook or server from accidental burns. The burns are caused when reaching into hot ovens, carrying hot and heavy pots and pans, or when dropping ingredients into hot frying oil. Our 5-finger oven mitts are available in a range of sizes to get you an optimal fit. Our oven mitts and gloves not only protect the hand, but also provide forearm protection so that the user can extend his arm to the hot surfaces without a second thought. Now concentrate on the work without worrying about the safety of your hands - our heat-resistant oven mitts and gloves will do that for you! 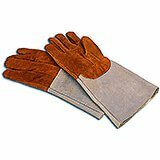 Leather Heat Resistant Oven Gloves, 4"
These oven gloves are the perfect safety gloves when handling items up to 572° F., commercial grade. 5 fingers. Made of leather, with woolen inner layer. Can be used up to 572° F. Forearm protection. Measurements: 4" L. Weight: 8 oz. 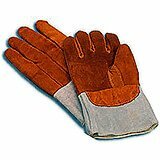 Leather Heat Resistant Oven Gloves, 7.75"
These oven gloves are the perfect safety gloves when handling items up to 572° F., commercial grade. 5 fingers. Made of leather, with woolen inner layer. Can be used up to 572° F. Forearm protection. Measurements: 7 3/4" L. Weight: 10 oz. 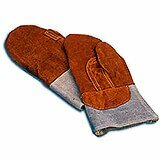 Leather Heat Resistant Oven Mitts, 4"
These heat resistant oven mitts are perfect when handling items up to 572° F., commercial grade. For heat protection made of leather. Can be used up to 572° F. Oven mitts with forearm protection. Measurements: 4" L. Weight: 14 oz. 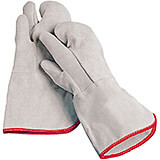 These heat resistant oven mitts are perfect when handling items up to 572° F., commercial grade. 1 Pair of gloves. For heat protection made of leather. Can be used up to 572° F. Oven mitts with forearm protection. Measurements: 8" L. Weight: 1 lb. 1 oz. 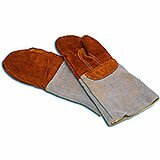 White, Cotton Oven Mitts, Three Fingers, 14"
This pair of three-fingered oven mitts are made of rough tanned leather and are heavily reinforced around the thumb. Its soft, flexible material ensures comfortable gripping of metal pans. Pans may be handled for sustained periods of time at a temperature of 215 degrees F. and may be handled briefly up to 680 degrees F.